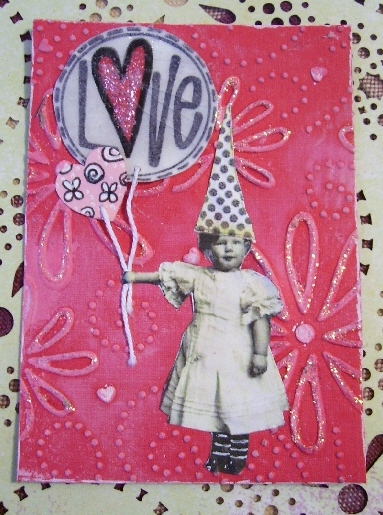 Yes you read that right, today is Valentine's Day with a little arty goodness to add. post after post. Without some of you I would not be fortunate enough to create some of the things I do, afterall you all inspire me. Ok I am not a sappy person or a mushy one, sometimes I tend to sit back and not always express how I feel but if you really knew me you would know by my smile or the way I look you would know I do LOVE you and appreciate how much you mean to me. Through OWOH I met this lovely mixed media artist Sharon House who is also a Canuck. Sharon's blog is amazing with stories of her art and she is a wonderfully talented lady. 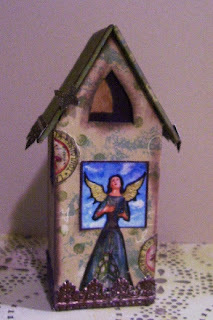 I was snooping around her site and came across these cute little houses made from old Reader's Digest mini book covers. The only thing Sharon asks before she sends you the download to the template is found on her site, so click here and just read, nothing to buy, nothing to do except follow or post a comment etc. So here I have made a couple houses to show you and I am so addicted to them. I have more ideas in my head and some will have to wait for Christmas but I also did some renovating to Sharon's original. I hope you and she like it. There are 3 templates in the file, the house below is the tallest measuring 4 inches. I cut the window out which is not included in the template, I did some alchol inking on some acetate and added them to the 4 windows. I did not photograph it here but one of those small battery operated tea lites just fit, turn it on and the windows light up with a soft glow. So very charming. I can see a Christmas village in my head.....ooo must write that one down for later. Oh and I did not use a book board for the houses, I bought some chipboard from my local scrapbook store, they sell it in 12x12 and smaller sheets. Make sure you have a good cutting mat and a sharp blade and be very patient and careful while cutting. This next house is the smaller template. This was actually my first house and got a bit beat up in the making but I was just playing and having fun. I didn't have any paper to match for my roof so I painted my own and that will be a tutorial coming soon. 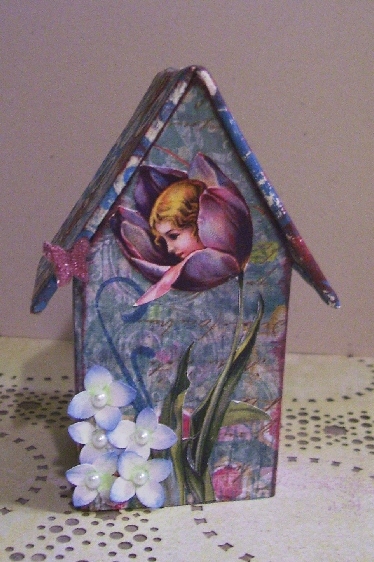 Both houses I used ARTchix Studio images. The little magnolia flowers were made using a heart punch, then I used a q-tip to colour the centers with green chalk and the outside tips with blue chalk and added my centers with tiny pearls. And this is my February matchbox for our FlickR group Monthly Matchbox swap with the theme of Romance. Well for the first time I did not use an actual image on the surface. 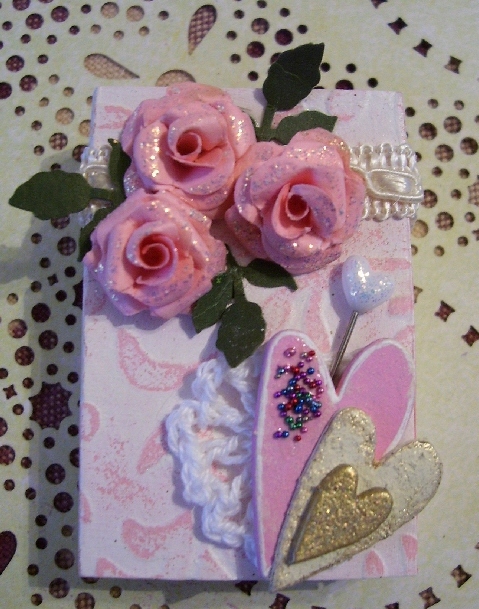 I thought it would be nice just to have something a little more girly and traditional. I used a Cuttlebug and paint technique I will do a tut as mentioned earlier. Made my roses, punched the rose leaves out, added some ribbon, crocheted a little flower (no I am really not a crocheter, I had to finally get a book out to know what stitches were what, I just made this one up in my head as I went along) and I painted some grungepaper hearts, added a heart pin and some Stickles. I hope my partner Tammy likes it. I filled it with all kinds of arty things. So have a lovely day spending with a Sweetheart, a family member and or friends. Love one another and be kind. Love the little houses! and your matchbox is a real beauty indeed. I just adore those flowers! You have really been busy with some fantastic results! Lesley, you did my little cottages proud! They are just darling... and your modifications are perfect. They make wonderful little Christmas houses, especially when you light them up. Love your matchbox too! Too cute.. you did a fantastic job on the little houses and the matchbox is gorgeous.. love it.. the tamster will adore it..off to check out the tut ..